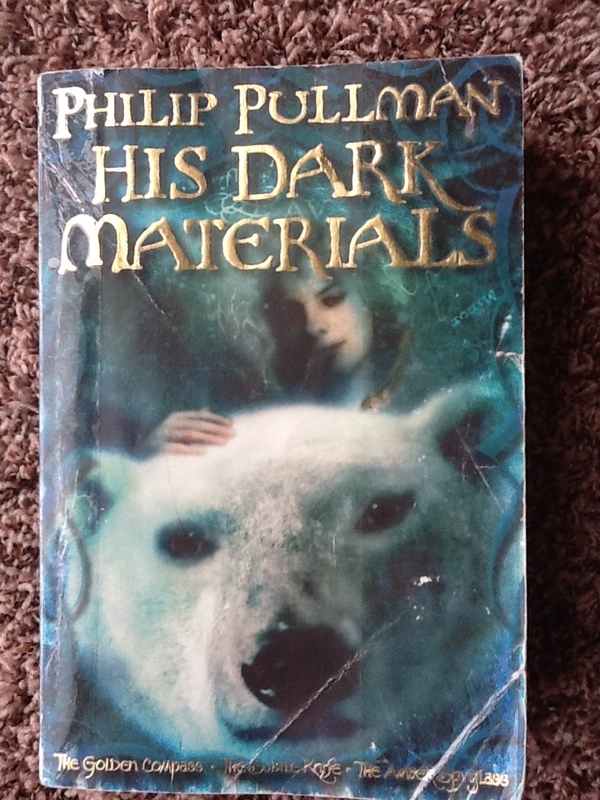 Myth Busting and Myth Building in Philip Pullman’s His Dark Materials – The Bookshelf of Emily J. A few years ago, my husband and I watched a popular television show. Whenever I tried to explain the show’s premise and action to somebody who hadn’t seen it, I sounded like a crazy person. “There’s a polar bear, a black smoke monster, and a hatch in the ground. The people crashed there on a plane, and among them are a doctor, several murderers, a man who was once paralyzed, but now walks, and a really funny fat guy.” Yes, I’m talking about Lost. It was one of those shows that had to be watched to understand why any of that would be compelling. Explaining it to somebody just made it sound ridiculous and unappealing. 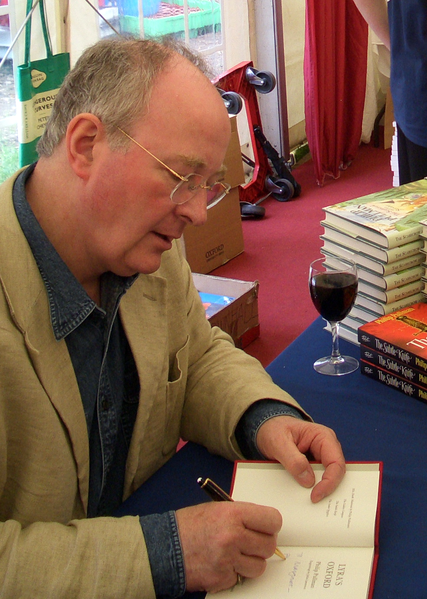 Well, the same may go for Philip Pullman’s His Dark Materials, number 9 on the BBC book list. The volume is a collection of three books about a girl named Lyra, a boy named Will, and their quest to solve the universe’s problems. The three books are The Golden Compass (1995), The Subtle Knife (1997), and The Amber Spyglass (2000). Along the way, they have dæmons, meet witches, fight Specters and Harpies, converse with angels, free ghosts, travel with tiny people on their shoulders, and wrestle with polar bears. “The golden monkey, seeing Mrs. Coulter attacked, set Lord Roke down and sprang to her defense, just as the witch flew down, knife at the ready. Lord Roke pushed himself back against the nearest rock, and Mrs. Coulter grappled directly with the witch. They wrestled furiously among the rocks, while the golden monkey set about tearing all the needles from the witch’s cloud-pine branch. Meanwhile, the President was thrusting his lizard dæmon into the smaller of the silver mesh cages. . . . Out of nowhere a seagull flew down with a wild cry and seized the Gallivespian in his claw. It was the witch’s dæmon” (803). Huh? This passage is pretty confusing and strange out of context. Despite the seeming peculiarity of the series, it is written for young adults and it is classified as fantasy. In that, it does its job. The series has also been criticized for being atheist and promoting anti-religious sentiments; however, I did not really see a problem with the books for that reason. Yes, Pullman has a main character, Mary Malone, describe her loss of faith. And the ultimate quest in the books is to bring down The Authority (supposedly God, but not really the Creator). The Church in Lyra’s world is a definite villain, and seems to be modeled after the Catholic Church (especially given Mary Malone’s change from a nun to an atheist and the veiled references to the inquisition). Several times, the book says that there is no heaven. However iconoclastic Pullman’s novels are, they replace the old myth with a new one, and the new myth looks an awful lot like the old. For example, the series ends with the idea that there is no Kingdom of Heaven, yet the characters vow to “build the Republic of Heaven where we are” (907). In this, I see Pullman’s disdain for living a life only focused on the next one, rather than living life to the fullest. Yet, he describes organized religion as such: “That is what the Church does, and every church is the same: control, destroy, obliterate every good feeling” (336). I can see where this is the view one could have of church. This idea tends to pervade the first novel, in which the children are being cut from their dæmons by the Church. After the procedure, they are dying and left soulless, without joy, emotion, or ability. These experiments, overseen by Mrs. Coulter, tend to be a metaphor for religion and its way of sucking the life and fun out of everyone and everything. However, I don’t think the idea of living fully, happily, and curiously (as the characters promote later on) necessarily opposes organized religion. My religion teaches that “Men are that they might have joy,” and I know that many religions promote good citizenship, political involvement, love towards neighbors, charity work, and bettering oneself physically, emotionally, and intellectually. Overall, Pullman’s new myth isn’t bad or necessarily opposed to the old one; it is just different and focuses narrowly on the idea that commandments or religious precepts are somehow stifling or narrow-minded. I tend to agree with him at times, but nothing is black and white. When I say myth, I am referring to the ideas I wrote about in my post here on Dune. I do not wish to repeat myself. And along the lines of myth, Pullman has created characters who closely follow the hero cycle, which I have written about in depth here in my Harry Potter post. As a short review, a hero is somebody who faces great danger as an infant or child (think King Herod killing the male babies when Jesus was born), has a mentor, takes a journey or a quest, descends to the underworld to complete this quest, and ultimately saves his people. A hero also bears the scars of saving his people and often must sacrifice himself to accomplish good. Will and Lyra follow this pattern pretty strictly. My favorite novel of the series is the second, The Subtle Knife. This is the one in which Will is introduced, finds his way into another world, and meets and joins forces with Lyra. Will displays many of the hero’s traits. He is in danger for his life in the opening scenes of the books. His mentor becomes his father, whom he finds as part of the quest. (The father and son motif is a common one in myth and the hero cycle.) He journeys to find his father, and after that is accomplished, he journeys to help Lyra fulfill her quest, which involves going to the world of the dead and freeing all of the tortured spirits. (This sounds a lot like resurrection if you ask me.) Will and Lyra ultimately complete their quest by saving these spirits, stopping the war between “heaven” and Lyra’s father, Lord Asriel (a name that sounds a lot like “Israel”), and closing up the windows between the worlds that are causing Dust to leak and destroy the universe. (It’s starting to get confusing to those of you who haven’t read the series.) Anyway, my point is that Will and Lyra are heroes. As to their relationship, they seem to represent Adam- and Eve-like figures, yet they never fulfill the entire myth by procreating. (Thank goodness for that, since they are thirteen. But, there are some scenes that suggest they get sexual.) Lyra’s life at one point is sought by assassins from the Church, who believe she fulfills prophecy. They call her Eve in the book. Why they would want to destroy her I could never understand, but they fail because of an angel. A hint to their hatred of her has to do with her name: Lyra. She is a liar from the beginning, but she eventually learns to tell truth through her golden compass, the alethiometer. Her truth-telling is what makes her a hero, yet her truth is different from the Church’s truth, so they want her eliminated. They also want to eliminate her agency. They want to prevent “the fall” rather than allow her the experience gained by doing so. To me, agency is one of the greatest gifts we all have, so for a “church” to try to take it away is most offensive. Later, the children bask in their freedom to choose, and vow to live their lives doing so freely. I like that this book has children as the heroes. All successful children’s literature does this. However, Pullman does not follow the sometimes annoying pattern of making the adults complete idiots. I tend to think those books are funny, but they send a misguided message to children: that they are on their own and that adults cannot help them. Adults can help, and should help children navigate that scary time between childhood and adulthood called adolescence. Because of Pullman’s use of myth, legend, and folklore, there are a plethora of similarities to other amazing children’s fantasy series. The Harry Potter series came to mind several times as I read. Will and Lyra meet Specter’s along their journey. These are invisible-to-children, soul-sucking, ghost-like figures that make all adults dead in the eyes. Sometimes the description of their effects on people sounded like mental illness. Overall, they reminded me of the dementors in Harry Potter. The dæmons are also similar to Harry Potter’s patronus figures. Those are in animals shapes, and the dæmons change animal shapes until the human to which they are attached become older. The owls in Harry Potter also reminded me of the dæmons because of the simple connection between humans and animals, an obvious feature of the dæmons in Lyra’s world. Interestingly, the witches in His Dark Materials are not evil, also similar to Harry Potter’s world. In fact, the witch most involved in Lyra’s quest is Serafina Pekkala, whose first name brings to mind the word “seraphim” or angel. She tends to act as a mentor to the children as they journey. More Biblical is one of the evil characters, Sir Charles Latrom, who has a snake dæmon, goes back and forth between worlds, and has nothing but bad intentions for the children. This motif of the snake is also repeated in the history the mulefa tell Mary when she visits their world. Also Biblical and heroic are the spiritual gifts Lyra and Will have to help them complete their quest. Will is chosen by the knife (by losing two of his fingers―remember the scars of a hero), and he must concentrate carefully to be able to cut windows to other worlds. Interestingly, Will momentarily loses his gift when he is beguiled by Mrs. Coulter’s beauty and sensuality in a moment of weakness. For Lyra, she has the golden compass, or alethiometer, which she reads easily despite many scholars studying for years to be able to do so. Yet, once their quest is complete, they lose these gifts. They only need them during the time of turmoil and strife, not for when they go back to “real” life and must then learn to choose, learn, and grow on their own. “Life is hard . . . but we cling to it all the same” (503). “Dust . . . settled over every human being, no matter how dutifully they kept the laws” (597). I like this because it reminds me that we all make mistakes and that it is human to do so. “She was beginning to see how narrow her scientific horizons were” (612). This tends to represent all of us. We truly have a narrow view of the universe, and Pullman’s fantasy series challenges that view and opens up new possibilities for life and other worlds. “A truth that’s told with bad intent / Beats all the lies you can invent” (647). These are lines from the great poet William Blake that are placed at a chapter heading. “[W]e have to build the Republic of Heaven where we are” (814). “I can’t choose my nature, but I can choose what I do. And I will choose, because now I’m free” (854). After Will declares this, his father says, “Well done, my boy. Well done indeed” (854), similar to what Christians believe Heavenly Father will say to them once they complete their own quest in life and return to Him. There are so many more examples and ideas I could share about this book and its mythic qualities, but for now this is enough. I enjoyed Pullman’s iconoclasm. He is a great storyteller, the narrative is gripping, and his use of myth is admirable. At the end, he acknowledges, “I have stolen ideas from every book I have ever read. My principle in researching for a novel is ‘Read like a butterfly, write like a bee,’ and if this story contains any honey, it is entirely because of the quality of the nectar I found in the work of better writers” (934). He then goes on to mention John Milton’s Paradise Lost and the works of William Blake. What did you think? I know this book was/is controversial. Any thoughts? Pullman, Philip. His Dark Materials. New York: Alfred A. Knopf, 2007. I thought it was a good story teller telling what could have been a great story. I read them all, but do not like my brief escapes from real life to try to moralise me. Don’t get me wrong, I freely chose to read them, just thought they could have been better without the God factor. CS Lewis had a go at it too, but was a better story teller. That’s a good point. It may have been a more enjoyable series without all of the blatant religious themes. The myth I would keep, though. That’s what makes a great story. I think Tolkien did the myth best, but yes, keep the myth. To be fair, Tolkien did spend his life studying and teaching myths, so he had a fair few steady templates. I’ve only read The Hobbit, but LOTR is on my list, so I will get to it, eventually. I will keep myth in mind as I read. I always read it as pro-religion, pro-faith, but anti-Church. Pullman seems to be separating the organizations and bureaucracies of religion from the belief system itself. That would explain the anti-church sentiments but then replacing the “church” with similar ideas. Thanks! That clarifies some thoughts for me. I’m not a big fantasy fan, so I was worried about getting into the books, but I did enjoy them and had trouble putting them down, as you say. I couldn’t understand why our church made such a fuss about the Golden Compass. I watched the movie with my kids so I could answer any questions, but seriously, if a book or movie is going to make me renounce my faith, maybe I never had any faith to begin with. I love your book reviews. i had no idea I could get all 3 works in one book. I will definitely be on the lookout for this. I feel the same way. The books are harmless and you hit the nail on the head with your comment about faith. I had a hard time when I heard about people burning and banning Harry Potter as well. Really? It just shows ignorance. Thanks for reading! No problem! You make some interesting points. I am glad that you and another commenter pointed out that the author is really exposing authoritarian control that sometimes characterizes religion. That has expanded my view of the books. And I agree about the references to great literature in children’s books. I am a big proponent of reading to my own children. I firmly believe that is the way to a great education. I think the Lemony Snicket books accomplish that somewhat, but perhaps in a simpler way. I like how he uses large words and then explains what they mean to the reader. Pullman is one of my favorite authors! Great post! I enjoyed these books. Do you recommend any others of his? i would recommend a book i have not read but really want to read out of curiosity, the good man jesus and the scoundrel christ. my library doesn’t have it and probably won’t ever get it (i go to a Christian college), but i heard it was really good. i would recommend a book i have not read but really want to read out of curiosity, the good man jesus and the scoundrel christ. my library doesn’t have it and probably won’t ever get it (i go to a Christian college), but i heard it was really good. The Butterfly Tattoo and The Broken Bridge are also amazing books. Good post. I enjoyed this and understood the points you were making. This is a brilliant thorough review. I read the book as a teenager and the whole anti-church sentiment went over my head. I studied the books again recently and couldn’t get over the whole idea of ‘killing God’. I thought the book’s portrayal of the Church was too one-sided. The story needed a redeeming character from the clergy. That said I was constantly reminded of the Catholic Church in Ireland here as I read the book. It made think long and hard about parallels within the story. Thank you! Yeah, I’m not sure that the first theme I would’ve seen would have been “anti-church” if it hadn’t been so highly publicized. It is an interesting read nevertheless.